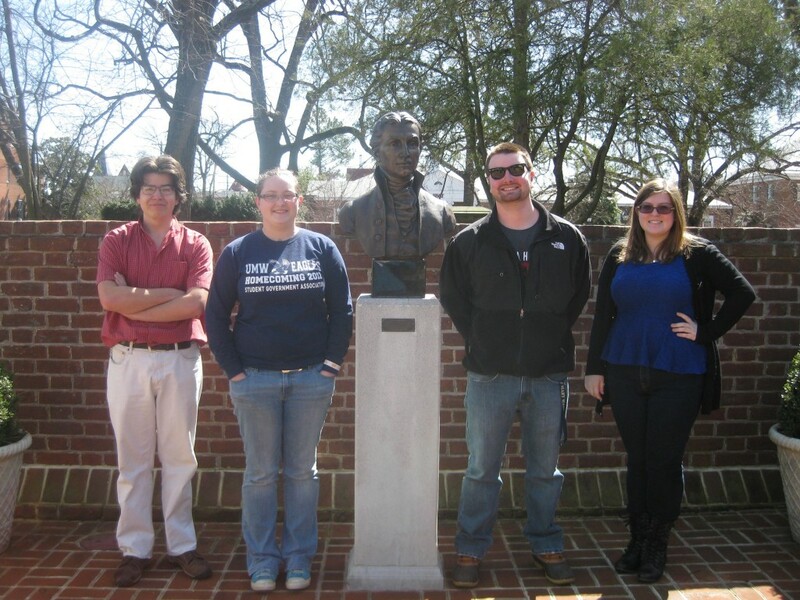 Ike Copperthite, Victoria Skaggs, Eric Greenlaw, and Amanda Vercruysse stand beside the bust of James Monroe at the James Monroe Museum. Amanda Vercruysse: Amanda is the group manager and primary web designer for the website. She focused on designing the website, arranging both group meetings and meetings with DTLT and the James Monroe Museum. She also worked diligently to provide consistency within the website in terms of photograph description, page layout, and exhibit scripts. Amanda was key to the realization of this project. Amanda is graduating in May 2014 with a Bachelor’s degree in American Studies and Historic Preservation, with a minor in Museum Studies. She is going onto graduate school at George Mason University to earn her Master’s in History. Ike Copperthite: Ike is second in command for the web design, assisting Amanda with technical issues and design ideas. He came up with our awesome slogan: James Monroe Gets Digital. He also created and continually updated the timeline. Ike will graduate in May 2015 with a Bachelor’s degree in History and a minor in Museum Studies. Ike plans on working in the museum field after graduation. Victoria Skaggs: Victoria is the 3-D goddess. She was the only one to successfully run any of the scans with the Kinect. She also was in charge of storing the scans, uploading them to Sketchfab, and then placing them on the site. Victoria also helped with web design, especially with plugins and widgets. Victoria is graduating in May 2014 with a Bachelor’s Degree in History and Spanish, and will attend graduate school for her master’s in Foreign Languages with a concentration in Spanish/Bilingual-Multicultural Education at George Mason University in the Fall. Eric Greenlaw: Eric conducted the interviews and transcribed the text for the website. He also assisted with research and exhibit script writing. Eric will graduate in in May 2015, with a Bachelor’s degree in history. Due to his enjoyment in being outdoors, Eric plans on being a park ranger. Our group would like to thank Jarod Kearney and Scott Harris at the James Monroe Museum and Memorial Library for allowing us to scan museum objects. We also want to thank Tim Owens and all of DTLT for their help on the technological side of things, especially when it came to fixing issues with the 3-D scanners, as well as the ThinkLab aids who made sure our prints came out well. Our classmate, Leah Tams also deserves thanks for taking our group photo and some videos of us scanning. We also want to thank the UMW History and American Studies Department for lending us necessary equipment and trusting us to give it back. Finally, Dr. Jeffrey McClurken deserves thanks for overseeing our project, providing us with feedback, and for giving us the opportunity to create this site.